Ever feel like life is a blur? Do you sometimes feel bogged down and overwhelmed by it all? I do. We live in times of unprecedented busyness. The demands and pace of work and life are at an all-time high, and they don’t appear to be slowing down anytime soon. Work is frenetic. Change is constant. And life is as well. We are juggling it all: careers, families, volunteer and personal pursuits, and more! Of course, the busy factor is not all imposed on us. We choose much of what’s on our plate. If you are like me, you want to work hard, produce, and contribute. You want your life to include family, friends, meaningful pursuits, hobbies, volunteering, and learning. You want it all. Why, oh, why can’t we have a nine-day week to fit it all in? Whether our loads are self-imposed or put on us, many of us are doing our best to squeeze it all in, and we’re starting to burst at the seams. I wrote this book because I found myself feeling overwhelmed more often than I’d like, and I noticed that far too many others felt this way as well. While many of my clients come to me for different agendas related to their careers, lives, or leadership development, all too often, the theme of feeling overwhelmed comes up. Many people struggle with the following thoughts: How will I get this done? The pace is just getting unbearable. I have no time. I’m exhausted—and more. I’m not referring to laggards or people who can’t cope—quite the opposite, in fact. They (and I) are successful and accomplished professionals who are getting things done, stretching and adapting to ever-increasing change—but at a cost. 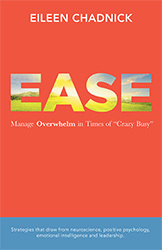 In times of sustained “crazy busy,” the feeling of overload has become an equal-opportunity issue for leaders and others alike. It’s taking a toll on far too many of us. In March of 2012, I had an opportunity to suggest a theme for a webinar I was to present to members of the accountancy profession in Canada. Hosted by the Canadian Institute of Chartered Accountants (CICA), now called Chartered Professional Accountants of Canada (CPA), the opportunity was to focus on either a personal or professional development issue. I suggested the topic “Bogged Down with Too Much to Do? Tips and Strategies for Handling It.” The timing was just before the cusp of tax season, so I didn’t know if tax professionals would take an hour out of their day to listen to what they might consider a soft topic. However, more than 3,500 people registered for the presentation! Afterwards, I received scores of emails acknowledging the value of the tips and asking me for more. This response affirmed to me that the issue of overwhelm was becoming even more salient than I had imagined. Are Times of “Crazy Busy” Now the New Normal? We used to have seasons that were busier than others. Today, it seems every day is the season of rush. We might not notice this, because we hunker down and focus on the demands of the day. Perhaps you are doing much of what you set out to do. But underneath the surface of high performance, perhaps you are noticing a few signs of wear and tear on your personal and professional well-being. The damage might be subtle—like a small crack in veneer. Do you catch yourself feeling more bogged down than inspired or energized? Do you find yourself saying you will catch your breath once this one last project is complete, but then, no sooner than the project (or particular life challenge) ends, you are on to the next one and once again hope for that day when you’ll catch your breath? Have you accidentally missed any appointments lately? Or woken up and suddenly realized you had a meeting scheduled that day, but because you forgot, you were not prepared? How’s your reservoir of creativity, resourcefulness, and energy? Feeling a bit depleted? What about sleep? Are you having trouble getting enough sleep? Staying asleep? Getting quality sleep? And how’s that affecting your work? Your mood? Your sense of well-being? Perhaps it’s time for something different. When I owned up to the fact that I had been working and living with what I refer to as “overwhelm static” in my life for too long, I knew I needed to change something. I didn’t want to disengage from the activities of my life; I have goals, plans, and dreams, and I want to work hard and live full out. But I also knew I wanted to feel more at peace and energized on a more sustained and consistent basis. I wanted to work hard but with fewer struggles. I wanted to feel more ease in my life. And I have had many clients who have expressed this same desire. Interestingly, the definition of ease is to remove what burdens us. Life isn’t going to slow down; the pressures will likely continue. So we have to adapt. Realistically, it wouldn’t be possible to simply remove all sources of burden, but we can learn new ways to engage with them and with ourselves to create more ease. But I want more than that—more than simply removing burden. Our brains, bodies, and spirits need to work towards something, not just away from something. I want to up the ante on well-being. How to work and live with more ease and experience greater well-being—that’s what this book is all about. The heart of this book is a toolkit filled with strategies and ideas to navigate the demands of work and life with more ease and well-being. Like you, I live a fluid, dynamic life and recognize there is always room for improvement. In looking closely at my own habits, I found many strengths that were helping me, but I also discovered gaps that were like leaks in my own well-being bucket. I bet this is the same for many of you. I see this with my clients. We do a lot right, but some of our habits (or non-habits) can become a critical source of drain on energy, resilience, and potential to be fulfilled. From my experiences in my life and with clients, I compiled a volume of strategies and ideas that I refer to as tools. None of the ideas I offer are difficult or complex. In fact, some are embarrassingly simple and might be reminders of what you already know. Yet despite their simplicity, they work. The rationale behind most of the ideas (i.e., tools) I present draws from an army of expertise from the fields of positive psychology, neuroscience, leadership, emotional intelligence, coaching, and more. Some are my own, and some come from others. All have been tried and tested in the field and also in my own “kitchen”—with myself and hundreds of clients over the years. I would have liked to write a book that promised three easy steps to wipe out overwhelm—it would have sold millions! But I know better. This business of overwhelm is multifaceted and personal to each individual. This book does not offer a prescribed system. Each individual is unique and most likely will need to tap into different areas for his or her own situation. So rather than a prescription, I provided a toolkit—a repository of ideas and tips that can be customized into your own personal well-being plan. Deconstructing Overwhelm:The first thing we are going to do is get our arms around understanding overwhelm from a mind-brain perspective. Many of the strategies (i.e., tools) are designed around current understanding related to the mind-brain connection. I’m sure you’ve heard the expression “It’s all in your mind.” Well, this is quite right. But that doesn’t mean it’s in your imagination and not real to you. Our brains and minds are powerful forces, and we need to better understand them so that we can intentionally work with them rather than against them if we are to experience more ease, success, and fulfillment. Despite the simplicity of the tools presented, there is a backbone of some neuroscience, some mindfulness, and both emotional and positive intelligence supporting the ideas. Being mindful is essential to working with more ease and experiencing greater success and well-being. The opposite—having an overly distracted or excessively full mind—can lead to a first-class ticket to feeling frazzled and overwhelmed. Our starting focus in the toolkit will be to help you manage the volume of stuff on your plate (and in your head!) so as to avoid that trap. Next we’ll move on to developing more-empowering thinking strategies. Being mindful is no longer the exclusive domain of Buddhists. Anyone who wants to be on his or her best game needs to make the mind a friend, not a foe. In this section, we will dive into strategies to develop conscious mindsets that can create powerful shifts in how we engage with ourselves and the challenges present in work and life. Small shifts in perspective can powerfully boost our capacity to get things done—and with more resilience, optimism, and creativity. This mindset is not only about being more effective; these mindful approaches are also brain-friendly ways to manage the biological responses that occur with stress and reap the rewards of more conscious, reflective mindsets. In the last part of the toolkit, we will focus on developing positivity habits. Once upon a time, it was a guilty pleasure to pursue happiness and fulfilment. Now there is a bounty of research affirming how important positivity is for our mental, emotional, and physical well-being and our ability to flourish at work and in life, especially in times of challenge. We’ll explore some of the essential habits that come from fields of emotional intelligence and positivity psychology. These tools are easy to do and offer powerful results. Along the way, you will meet some people in the “Stories at a Glance” sections. In some of the stories, the individuals and issues represent aggregates of clients or people I know; in other cases, the stories come from a particular individual. In most cases, I have changed their names to protect their identities. I’ve also shared many of my own personal stories too—even a few embarrassing ones! The parts of this book are intentionally not assembled. The game plan is to give you ideas that you can choose from to meet your personal needs. In the last section of this book, I will offer you additional exercises and further guidance to help you create a customized approach that works for you. You can draw on the ideas that resonate with you to design your own personal well-being plan. You find yourself feeling bogged down more often than you would like. You wanted it all but now find it increasingly more difficult to do it all. You are successful and can handle a lot, but you could use an energizing spark. You see challenges and opportunities ahead and want to take them on with gusto, but you are wondering if you can handle any more beyond what is already on your plate. You don’t want to step down your game; you would rather step it up, but you will need a heartier, more productive, and more resilient you to achieve that goal. You manage to get through your days okay but lately have been having trouble sleeping, which is threatening your capacity. If you identify with any or all of the points above, then welcome aboard. And get in line—right beside me. Remember, I’m with you on this journey of taming overwhelm and living with more ease and well-being. Available from most major online retailers See here!